I am embarking on a new phase of life. At age fifty-mumble, mumble, I have determined that I will marry. A man I met online. Whom I have yet to meet face-to-face. Stop screaming. Yes, I know. I really, really do know. I do hear what my friends and family have had to say and their concerns are valid. They are valid. I am taking my time, and being careful – as is he. I have learned in a year and a half of living alone for the first time since I ….for the first time ever, that I do just fine living alone. I have hobbies. I go to the gym, I cook decent meals. I read books and see movies. I chat with friends, and socialize with them, too, on occasion. I have discovered I rather like myself, and we have become such good friends that I like being with just me rather a lot. So, why marry at all? Toast is the metaphor for me to help explain this choice (to you and to my friends and family). I like toasted bread. I prefer toast that is like my single life: dry whole wheat. Nutritious, healthful, low-calorie, calm, plain. Not boring plain, tasty plain. When it is plain, I can add jam, honey, or syrup, peanut butter or Nutella now and then, if I choose – just like my single life and its occasional, special treats. Otherwise, I prefer the plain, dry whole wheat toast. I like it. Often, while I am reading, I will toast a slice and consume it without even hardly noticing it, except for the satisfying crunch. Toast with butter, however, is different. It is rich, complex, full of flavor. Buttered toast is unable to be consumed absently while otherwise engaged in reading my latest fiction selection. It demands my whole attention, that toast, because if you don’t pay close attention to it, it will drip melted butter down your fingers all the way to your elbow, sometimes messily dripping off to stain my tidy slacks or my nice, clean dress. Toast with butter is married life. It can be messy and untidy, but the experience of having it makes dry whole wheat pale in comparison. Yes, it demands your attention and effort in ways that single living does not. But the richness of married life, with an honest, loyal, and committed partner, is what I’d rather have, thanks just the same. 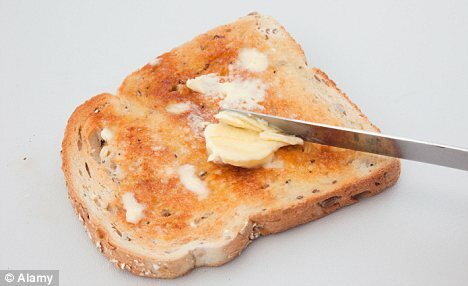 And I can still add the occasional toppings when I like to buttered toast – it isn’t just butter only forever and ever. Occasionally, just for fun (for a day) or when necessary, I can even have it plain again. The process of creating a secure, stable married relationship begins with communication, and that can and does happen online in many of the identical ways that it happens face-to-face. Yes, there are people who misrepresent themselves online (which admittedly facilitates that deception somewhat), but the same thing happens all too often in the face-to-face situation as well. We have had months of conversation, and will have months more, before we meet. In a public place. 🙂 After all, he does not know 100% if I have represented myself honestly and accurately, either. I have also given much thought lately to the centuries-old tradition, still extant today, of arranged marriages, where the families decide and often bride and groom meet face-to-face only after the vows are spoken and the papers are signed. Many of those marriages actually do work. There isn’t necessarily a lot of evidence that our modern notions of how things are supposed to be done is the better way. Commitment is commitment. This entry was posted in Life and tagged arranged, butter, drip, dry, family, friends, life, married, messy, modern, Nutella, online, plain, relationship, single nutritious, toast, tradition, whole wheat. Bookmark the permalink. Great post! My husband and I have been married for 15 years this past March. We met online. We talked for over two years before we met face to face; we married 3 months later. Thanks for the encouragement. I felt that foundation in conversation first was the way to go, where the F2F physical attraction, hormones and pheromones could not get in the way, could possibly result in a better outcome than what I’ve previously experienced. It does appear to be working out that way. Hope springs eternal!